Paintless Dent Repair is a method used to manipulate the metal back into shape without having to bondo, sand, or paint the dent. PDR removes small dents from the painted sheet metal panels of a vehicle using a specialized set of tools and techniques to re-sculpt the damaged area from behind without affecting the paint. A wide range of damage can be repaired using PDR as long as the paint surface is intact. 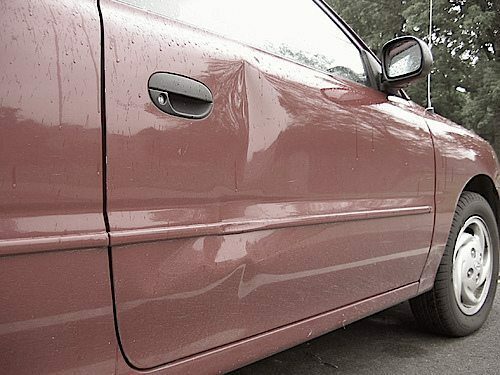 The most common use for PDR is to repair hail damage, door dings, minor creases, and large dents. PDR can also be used to prepare a damaged panel for repainting by minimizing the use of body filler. When can’t Paintless Dent Repair be used? If the metal of your car has been stretched by the damage, PDR might not be possible. It can be difficult to use PDR if the vehicle’s paint isn’t flexible, but most of today’s automotive paint allows for successful PDR. Dents several inches in diameter can be repaired by this method as long as the metal and paint are not stretched. Most experienced technicians (like the ones at Great Plains Auto Body) can repair a shallow large, dent to an acceptable level, but sharp dents may not be suitable for PDR. What are the advantages of Paintless Dent Removal vs. Traditional Dent Removal? It restores the original look of your vehicle without the need of bodywork or repainting (both decrease the value of your vehicle). It’s often less expensive than traditional repair as there are fewer steps involved than in the conventional repair process. Fewer steps means less materials used and less time to complete the repair. Less time and materials working on the vehicle translates to fewer hours and materials billed. PDR is generally a quicker repair because there are fewer steps in the repair process. PDR doesn’t require the use of auto paint or other environmentally detrimental products. Traditional auto body repair relies on chemicals throughout the process. PDR restores the metal to its original shape without the need for any of the additional materials. It releases zero harmful chemicals. PDR is a great choice when it comes to small dents; it’s cheaper, quicker, more eco-friendly, and maintains the value of your vehicle. Your technician will be able to tell you if your car’s dents or dings are eligible for PDR.